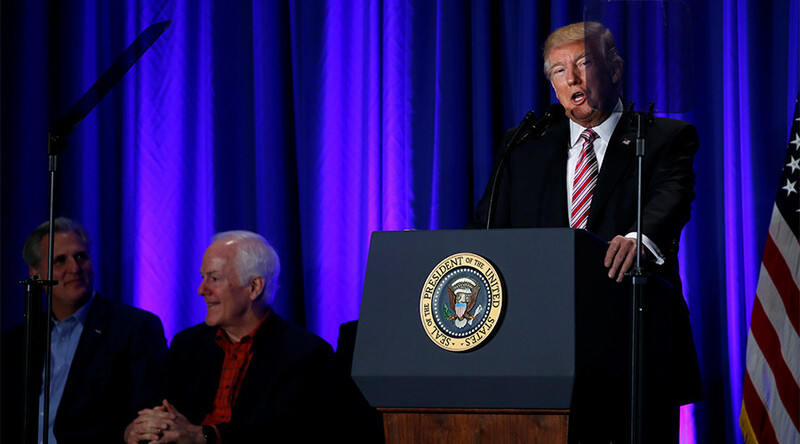 President Donald Trump urged the Republican members of the US Congress to help him deliver on the ambitious agenda of reforming the government, renegotiating trade deals, and building a wall on the border with Mexico. The two-day working retreat in Philadelphia, Pennsylvania aims to sketch out an ambitious legislative agenda for the first 200 days of the Trump administration. On Wednesday, the GOP discussed repealing Obamacare, rewriting the tax code, and funding for defense and border priorities, among other issues. “Now is the dawn of a new era of American independence, a rededication of the idea that people are in charge of their own destiny,” Trump told the cheering legislators. “Enough 'all talk, no action'. We have to deliver. This is our chance to achieve great and lasting change for our beloved nation,” he said. Trump briefed the lawmakers about the executive orders he issued during his first week in office, from canceling the Trans-Pacific Partnership to the controversial instructions to build the Keystone XL and Dakota Access pipelines and starting the construction of the border wall with Mexico. “The hour of justice for the American worker has arrived,” the president said. Criticizing the North American Free Trade Agreement (NAFTA), Trump said that he and the president of Mexico “have agreed to cancel our planned meeting next week” inlight of Mexico’s refusal to pay for the wall. “We want to get our people off of welfare and back to work,” Trump said, to applause. “We are now only at the beginning of this incredible journey together,” he said.